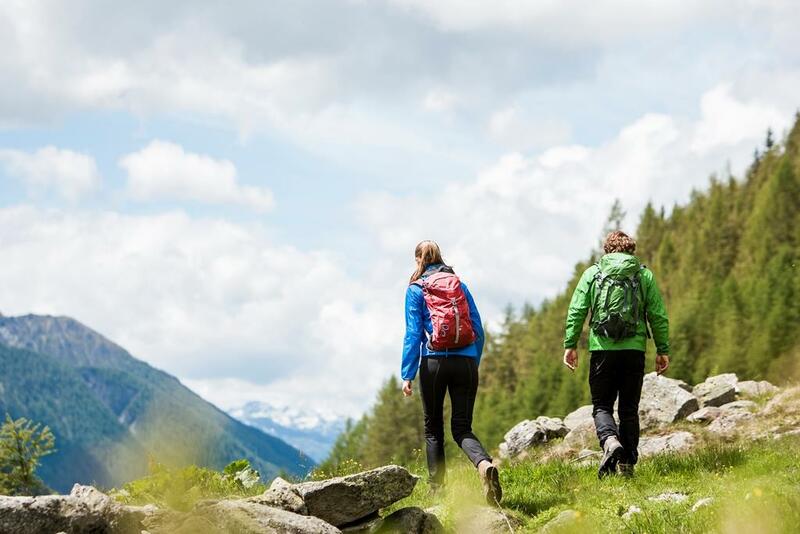 Round-trip tour from the Sam to the Griesbach valley… The Sam cabins are truly picturesque, and from there you can marvel at the panorama of the entire Ahrntal, from the mighty High Tauern mountains to Luttach at the beginning of the valley. In comparison to other hiking areas, this territory is not overrun with people and even during the high season you can enjoy a hike in silence and solitude. The round-trip walk to the Sam cabins and to the Griesbach valley can be done without using your car, you can use the public bus transport instead. From the bus stop at the old barrack in St. Peter (1,241 m) we walk along the road uphill to the church in St. Peter (1,327 m), proceeding to the Locherhof farm (1,516 m). There we follow forest road nr. 16 northwards until we reach an altitude of approx. 1,600 m. A signpost on a tree leads us on a path on the left-hand side. We ascend the path, crossing the forest road twice, until we arrive at the Samhütten cabins (2,011 m). Here we have reached the highest elevation of our tour. Just below the cabins we turn left and follow the path heading north-east, descending to the Winkler Alm (1,733 m). Now we proceed on forest road nr. 19, we cross the Griesbach brook, and arrive at the Taser Alm (1,720 m), continuing southwards until we arrive at the road. Attention, do not follow this road, but turn left immediately heading towards the farm Feuchtenbergerhof (1,513 m). From this farm, you can descend to the Obgries farms on paths nr. 17–19 and, turning to the right, on the road back to the start.